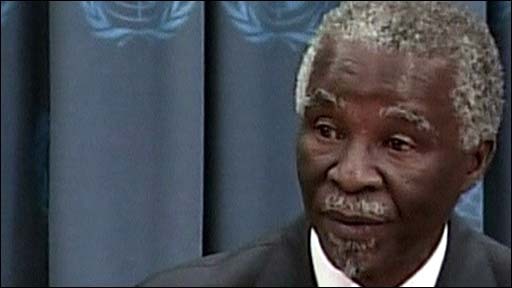 South African President Thabo Mbeki has defended his record on Zimbabwe, while playing down the crisis at a UN debate. His governing ANC party, however, said it was concerned about the deepening crisis brewing in its neighbour. 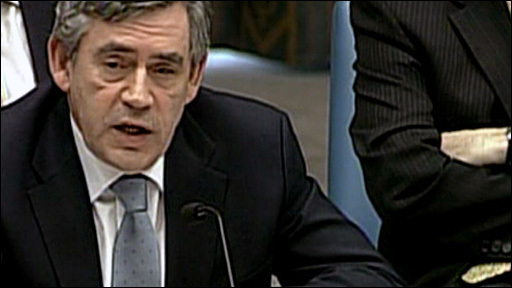 Gordon Brown told the UN Security Council no one believed Robert Mugabe won last month's presidential election in the country. Meanwhile, the opposition in Zimbabwe said 50 supporters were arrested after a strike over delayed poll results. Mr Mbeki had said there was "no crisis" in Zimbabwe after meeting Mr Mugabe on Saturday. He defended those remarks in New York, saying dialogue was essential to bring about a resolution to the situation in Zimbabwe, where 18 days after presidential elections, electoral officials have yet to announce a result. "The solution to the problem of Zimbabwe lies in the hands of the people of Zimbabwe," he said. "In our engagement with the situation, we needed to talk continuously at all times with both the ruling party and the opposition." As the UN Security Council met in New York on Wednesday, activists flew a giant banner above the UN, calling on President Mbeki to use his influence with Zimbabwe's leader Robert Mugabe. Mr Mbeki had called the special meeting to discuss how the UN could work with the African Union to bring peace to Africa's conflicts, from Somalia to Sudan's Darfur region. And although Mr Mbeki did not mention Zimbabwe during his speech, other leaders took the opportunity to raise their concerns. UN Secretary General Ban Ki-moon said the absence of a transparent solution to the impasse could mean the "situation could deteriorate further, with the serious implications for the people of Zimbabwe". Mr Brown said a stolen election in Zimbabwe would not be a democratic election at all. "No-one thinks - having seen the results at polling stations - that President Mugabe has won this election," the British prime minister said. "The credibility of the democratic process depends on there being a legitimate government." Mr Brown and other Western officials were expected to meet Mr Mbeki privately. The South African president has also come under pressure from his own party, the ANC, which is divided on the Zimbabwe issue. Breaking with Mr Mbeki's assurance that there is no crisis, the leader of the ANC, Jacob Zuma, said: "The region cannot afford a deepening crisis in Zimbabwe." In Zimbabwe, MDC spokesman Nelson Chamisa said more than 50 people were arrested countrywide during skirmishes in townships around the capital, Harare and Bulawayo. 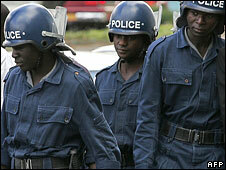 Police have accused the Movement for Democratic Change (MDC) of trying to incite violence with their strike call. Zimbabwean police reported arresting 30 MDC supporters for obstruction and intimidation, apparently including Chitungwiza MP Marvelous Khumalo. The MDC had wanted people to stay at home until the presidential election results were released, but is now debating whether to continue the strike action. But most banks, shops and offices opened as usual on Wednesday and armed police and soldiers were on patrol. MDC Secretary General Tendai Biti has said two party activists had been killed and 200 hospitalised after being assaulted by ruling party militias. And a coalition of Zimbabwean doctors said its members had seen and treated more than 150 people who had been beaten and tortured since the polls. The Zimbabwe Electoral Commission says it cannot release poll results until a recount in some areas is completed this weekend. Independent counts suggest MDC leader Morgan Tsvangirai won the election but took less than 50% of the vote, meaning he would face a run-off. His party says he will not contest a run-off unless there is a secure environment, with thorough international monitoring.